2016 was a very interesting year for smartphones: iPhones lost the headphone jack, much to the disappointment of users all over the world, while Samsung had an explosive launch – literally. Their S7 Edge and Note 7 phones started exploding all over the world and they had to do a major recall. Let’s see what the next year has in store for us. 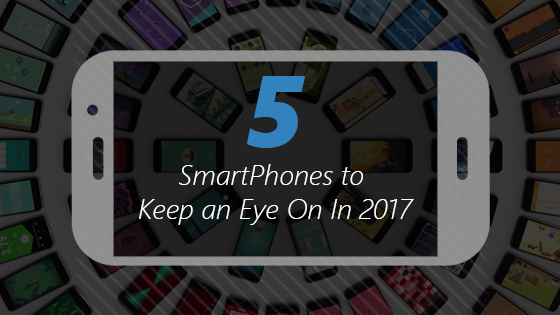 There will be a day when the iPhone is not the most awaited phone of the year – but that day is not yet here. iPhones continue to be incredibly popular due to their high build quality and fantastic features. There are a lot of rumors going around that the next iPhone will be much more revolutionary than the iPhone 7. There are also rumors that the phone will be mostly glass (following the minimal bezel trend) and may come with wireless charging built-in. How is Samsung going to follow up on the explosive S7 edge? They will have to do something drastic to make people forget what happened last year, which is why we are so excited about their next reveal. There are a lot of rumors circulating about the phone. One is that the screen resolution may be bumped up to 4k – which may sound unbelievable – but we wouldn’t put it past Samsung. The Galaxy S series is Samsung’s flagship series and they take it very seriously. One surprising tidbit that we do know about the phone is that it will join the iPhone in not having a 3.5mm audio jack. Ocean is the name for HTC’s next phone. HTC has fallen off a bit when it comes to market share, but they are looking to shake things up with their next phone. An internal presentation leaked out and it has gotten us excited about the HTC Ocean. HTC needs to offer something its competitors do not if it wants to make a bigger name for itself, and that is exactly what they seem to be doing. With the Ocean, HTC is focusing on changing the way we interact with phones. They are trying to think beyond buttons and towards more intuitive gestures for commands. Yes, you read that right. Nokia is coming back to the smartphone market. The Nokia P1 needs to be powerful and exciting if Nokia expects to capture even a tiny share of the gigantic smartphone market. The P1 is rumored to have an all-metal body and a fantastic camera, but specific details are hard to come by. LG is a surprisingly decent phone manufacturer. Their G line has been fantastic and the G6 seems to be another great addition to the line. This is their flagship phone so we can expect a lot of new features. And who knows, maybe they will finally solve the boot looping issue that brings their phones down every time. There’s a lot more to look forward to in 2017. The coming year will see a lot of IoT devices released that will work through our phones and may change the way we interact with the devices altogether.